Mivi, an Indian electronic gadgets brand, today, has launched Conquer, an all-new pair of wireless bluetooth earphones at Rs 3,299. The device is exclusively available on Amazon (https://goo.gl/oJnwFn) for the moment but will be available on most portals including Mivi.in, Flipkart and PayTm from 1st of February. The easy to wear, over-the-ear hook wireless earphones come with CSR 8645 and Bluetooth V4.1 technology, which provides a better signal strength ensuring high fidelity stereo music and clear speech. The earphones also come with aptx codec, which is a rare thing for devices at this price point. Mivi Conquer Bluetooth Earphones are available on an additional 15% discount on Amazon during the Amazon Great Indian sale. The earphones will be available at a price of Rs. 2,799 till 24th January. 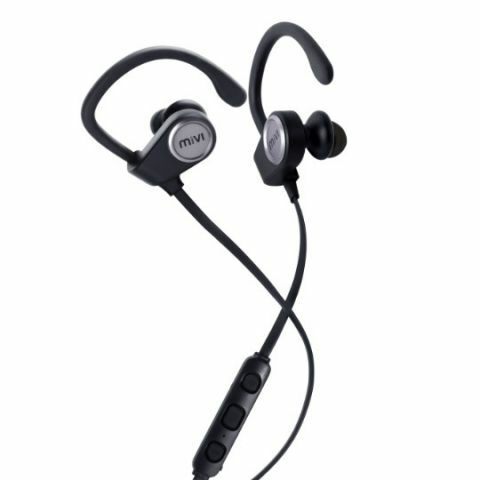 Mivi Conquer Bluetooth Earphones are exclusively designed for audiophiles and fitness fanatics who seek performance and comfort for longer use. The earphones support 10 hours of playtime and boasts a remote and in-built Microphones through which all music and call functionalities can be accessed and controlled. Commenting on the launch of the earphones, Midhula Devabhaktuni, Chief Marketing Officer and Co-Founder, Mivi said: “Music and sports are interconnected. Fitness is a growing trend in India which creates room for market players to expand with technologically advanced products at aggressive price rates." Conquer is an amalgamation of powerful sound and stylish built. With excellent grip during rigorous movement, this audio gizmo offers a minimalist, lightweight and ergonomic design with unique ear hooks thus solving the problem of all-day wearability. The wireless earphones offer crystal clear sound and a strong Bass which makes it a promising device.